A new peer-reviewed study in the open access journal, Environmental Research Letters** (ERL) confirms (again) the 97% scientific consensus on the causes of the current global warming. Scientists have looked at the evidence and come to a conclusion. The evidence is so overwhelming now that the consensus has grown - from 90% in the literature twenty-two years ago in 1991 to 97% for the twenty year period to 2011. Today 98.4% of scientists publishing papers relating to climate science and its impacts, agree that humans are causing global warming. We humans are causing global warming and climate change. The paper is by Cook et al** and titled: Quantifying the consensus on anthropogenic global warming in the scientific literature. It is by far the largest of its kind in the peer-reviewed literature. The authors analysed abstracts from 11,944 papers mentioning global warming or global climate change over the twenty year period between 1991 and 2011. Of the nearly 12,000 papers only 0.7% disputed the fact that humans are causing global warming. The papers represented the work of scientists from at least 91 countries throughout the world. Cook et al (2013) and two other similar studies all show at least 97% scientific consensus. In this latest study, abstracts of the 11,944 papers were analysed by 24 volunteers led by John Cook of the University of Queensland and owner of the award-winning website SkepticalScience.com. They cross-checked their work by having at least two people independently rate each paper's abstract. The people rating the abstracts didn't see the names of the papers' authors. They further cross-checked by asking the papers' authors. The research team was just a teeny bit (0.1%) more conservative in their categorisations than the authors of the scientific papers themselves, showing the paper's findings to be rock solid. Here's John Cook describing the study and its findings. To find out how to help the public become aware of the consensus, visit this new website: The Consensus Project. As I said up front, the paper was published in the open access journal ERL. Instead of reader pays, the journal requires an up front payment. To their credit, SkepticalScience raised the fee from its readers in less than half a day - so it's all there for you to read. No paywall. Lots of other good papers from top scientists there as well. Let's say for argument's sake that on average there are two editors per journal with 3% a year retiring or quitting editing. (Some journals might only have one editor, others ten or more and the bigger journals have dozens.) Even using that very conservative estimate, it would mean in aggregate there were more than 6,000 people from all around the world who have been secretly colluding for more than twenty years. And no-one's found out or provided a single skerrick of evidence for this imaginary collusion. What an achievement! If you believe that then I've got a bridge to sell you. I wish someone would ask Anthony: where are all the tens of thousands of "skeptics" whingeing that their paper got rejected? Not Watts himself - even he managed to get a paper published. Yesterday Anthony leaked the embargoed press release after Steve Milloy (yeah, another science denier) first broke it. About time Milloy was dropped from all news distribution lists since he can't be trusted to keep to embargoes. Anthony thought he'd get in early and try to frame the finding his way - dork! And from that (97%) he gets a consensus? From 97% he gets a consensus? Wouldn't you? Not Anthony, though. He feebly tries to tell his readers to "Ignore the 97%. Just look at the 1.9%!!!" I wonder how he'd go if 97 doctors examined his rash and fever, analysed a blood sample and then told him he had measles, while two drongos said it was just mosquito bites. How many science deniers like Anthony Watts can fit in the teeny weeny denier pit? Anthony decides to quote a snippet from a stolen email, in which a couple of scientists are arguing that wrong papers should be kept out of the IPCC report. Trouble is, Anthony's quote doesn't support his argument at all. On the contrary, it flat out contradicts it. Not only were those papers published in scientific journals (obviously, or there'd have been no argument), they were also included in the IPCC report! Yet, the papers in question made it into the IPCC report, indicating that no restrictions on their incorporation were made. The IPCC process contains hundreds of authors and reviewers, with an exacting and transparent review process. One can only conclude that Brandon believes consensus is only of value if it's a consensus among experts, like scientists in the case of science. Consensus among a motley mob of ideologically-driven deniers, conspiracy theorists and scientific illiterati from WUWT or The Blackboard is not only rare but meaningless. About the only thing deniers ever agree on is that it must be a giant conspiracy. They can't even agree on what the conspiracy is. 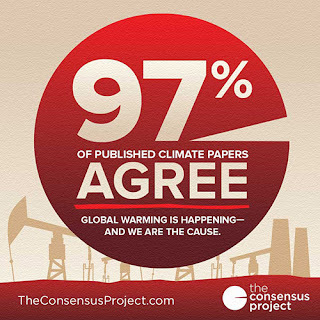 May 14, 2013 at 8:56 pm I am sick of being told “97% agree…” I want to be told THE EVIDENCE (yes, I am SHOUTING because no warmist ever, anywhere, any time, answers this question) – WHAT IS THE EVIDENCE. May 14, 2013 at 9:49 pm This paper is so bad that mocking it may improve its credibility. May 14, 2013 at 10:59 pm In 5th century BC, the Greek philosopher Empedocles postulated we could see things due to rays coming out of our eyes. Has David created a paradox for himself? Does that mean all the thousands of scientists creating knowledge today are wrong? If so, how does David know that Empedocles was wrong? May 14, 2013 at 10:01 pm So, they are trying to herd the population back into fear by reinforcing the idea of consensus amongst “scientists” who “know”. May 14, 2013 at 10:37 pm Hmmmm…..It appears their “concensus” (sic) is declining…. significantly…. (and as a reminder to himself, adds) ...Never let a touch of reality ruin your cause, right? 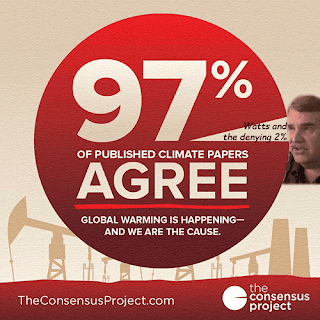 May 14, 2013 at 10:51 pm So 97% of 4000 papers endorsed AGW but of the “over 2000″ papers surveyed only 32.6% did? I don’t understand that math. 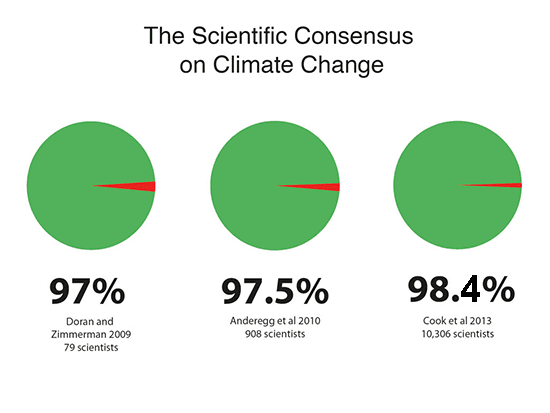 May 14, 2013 at 8:34 pm And “consensus” is exactly what part of the scientific method? I wonder if Galileo was aware of this concept. Sheesh. What a weird, contradictory, conspiratorial world deniers inhabit. An almost final word: Independent. If a denier should stray here from WUWT or The Blackboard, maybe they will be kind to the folk there, and whisper to Anthony and Brandon (and Lucia) what Riki tried to tell them: "I do not think that word means what you think it means…." Similar applies to words taken out of context. You might also mention that stealing is not only immoral, in most places it's illegal. As is receiving stolen property. May 15, 2013 at 1:12 am Fuzzy math: In a new soon to be published paper. I thought you might be referring to that one that simply ignored the TOB’s adjustments, but then I realised that piece of junk is never getting published. This is the Critical Decade. Sorry Sou I just don't buy it. I just checked Hotcopper and there is still no consensus. OK so the deniers on HC don't have any scientific credentials. They have rabid right wing ideologies. They own shares in fossil fuel companies and cheat each other by ramping those shares. But surely they should be considered when it comes to a consensus. Hmmm...What is their 'consensus' this week? Is it "no-one denies there is warming" or "it hasn't warmed for 16, 18, 30 years" or "we're heading for an ice age" or "no-one denies the climate changes, it's natural" or "Flannery-Bolt-algore (sic) drought" or "psychological misfire/Lysenko/reds-under-the-bed/15th century windmills" or "thumbs" or "carbon tax" or maybe they are recycling sea levels. Oh come on Sou, some credit for the hotcopperites. I just checked and the thread has moved on from the original posting of an AGW scientific consensus to Hitlers genocidal eugenics without breaking stride. OMG you weren't joking! You were making an understatement. WTF. They are all retarded. At one stage I thought jantimot was almost making progress but he's gone so far backwards. Where does he get his weird factoids I wonder. Benbradley is as crazy as ever with his nazi horridness - that man's a mess. Denmor's regurgitating Scholenburger's obsessive conspiracy ideation. Hanrahan almost comes across as 'normal' by comparison and he writes about climate science: "The whole thing is built on politics. EVERY alarmist on this board is a socialist..." . Should be enough to give people an inkling of what HC is like. I couldn't post what some of them came up with. Too disgusting. If I didn't know better I'd say they were auditioning for a black comedy edition of the onion. HC is now a zillion times worse than Jo Nova and iceagenow and infowars and prisonplanet and canadafreepress all rolled into one. WUWT is a paragon of good science by comparison. It's interesting how they all quote Phil Jones saying he'll "keep them out somehow", but it never occurs to them that perhaps the reason for this is simply that the papers in question are crap. Yes, Rachel, that was the reason for sure. The papers made it through peer review so 'skeptics' can't complain that papers from 'skeptics' aren't published. I say they can't complain but they do. What I mean is they have no grounds for saying that. Lots of papers from decent scientists never see the light of day in a journal. They end up in research institute collections or similar if they go anywhere. Thing is those papers in question even got into the IPCC. Not with much fanfare for obvious reasons. But they weren't excluded. Funny that on the same page that Watts dreamt up his '"skeptics" can't get published' fantasy, he posted another article crowing about a 'skeptics' paper that was published a couple of years ago. The chap has a very compartmentalised mind. "...of the 11,944 papers published between 1991 and 2011, 3896 papers or 97.1% endorsed human-caused global warming,..."
Thanks, Lars. My mistake. I'll fix it. The percentages relate only to the papers that expressed a position one way or another on global warming (4014 papers). I did a few edits and must have cut out some text by accident. Done. If you refresh the page it should make sense now. I found the whole WUWT "attack" on John Cook's paper quite odd. They certainly have a theme that there is a fundamental problem with climate scientists; they suffer from groupthink or benefit from endorsing AGW. They even had a post a short while ago arguing that the strong consensus amongst climate scientists was implicit proof of a problem. Given that, they should be very happy about John Cook's paper as it proves their claims of a consensus. Now they just have to go and prove that this consensus is an indication of a flaw with climate science. Have you read The Authoritarians? There's a link in the sidebar. It's a free download, easy to read and not all that lengthy. As with any categorisation, there are always people who don't fit the mould. Thanks, I'll give it a read. The one issue I have with using these kind of books to explain why some people act they way they do is that those on the other side of the debate point to another set of books that supposedly explain what's wrong with their opponents. On the other hand, it can also help clarify behaviours and reactions when dealing with people. Your own as well as the person you're interacting with. If you do read it, let me know what you think. "They certainly have a theme that there is a fundamental problem with climate scientists; they suffer from groupthink or benefit from endorsing AGW." In Dutch we say: "Zoals de waard is vertrouwt hij zijn gasten." Literal translation: "The inkeeper trusts his guests after his own character". Meaning: If you cannot be trusted yourself, you will be less likely to trust others. English equivalent: "Ill doers are ill deemers". If there is one group that suffers from group think it is the regulars at WUWT. Not even in the clearest cases of misquotations will they say that one of them may have crossed the line. No "sceptic" complained when Watts immaturely started calling me names. Conservative family values. As they are lying themselves everyday to defend their position, it probably comes naturally to them to expect scientists to be doing the same. Blogging is much more effective as writing a comment that gets lost in rubbish. Old lies keep on coming up and in discussions people still link to older posts of mine. That is much more difficult for a hidden comment. I am looking forward to the cartoon. If it is decently drawn, I will make a t-shirt with it and wear it like a badge of honour. Strange way to threat someone. A colleague of mine called me a climate "sceptic" recently after my EGU talk on the quality of daily temperature data. That was a real threat. :-) Must have been an effective talk. I hope the article will be just as good. Victor, you know, you have to keep to the party line completely -- no deviations! No one "breaks" an embargo if they didn't agree to it in the first place. I received the SkS announcement before the embargo time, which I never agreed to either, though I posted after that time only because I didn't get to it until then. The strong impression I got from reading David Appell's 'analysis' is that he is deliberately missing the point of the paper. Or he is lazy and didn't read the paper. Or both. Note to self. Don't send Davd Appell an embargoed press release. So what is the point I am missing? I get tons of embargoed material. But they are embargoes I agreed to. No one can be held to an embargo they didn't agree to. And why did SkS need to embargo this anyway? David, re why the embargo? You'll have to ask SkepticalScience or the journal. I'm not involved. I can take a reasonable guess that it had something to do with the time of publication of the paper. I believe that's usually how it works with science journals. Reporters who received embargoed material from science journals have all agreed beforehand to receive it and to respect the embargoes. Otherwise they don't send it. They do it, nominally, to give reporters plenty of time to write their stories, but really they do it to concentrate and maximize coverage. Thanks for your take, David. The implications of your posts are interesting. I would have assumed a journo would like to get press releases rather than not. But you seem to be saying something else. It's not of immediate value to me to know now, but could be useful info that I can use in the future. Also I'm not saying I would have broken this "embargo" if I had gotten to it earlier. Frankly it doesn't strike me as a important result, but Watts apparently thought it worth discussing, and unless he and the sender had a prior agreement, he had every right to publish about the study regardless of any claimed "embargo." Journalists who receive embargoed material from journals and institutions have already agreed beforehand to respect those embargoes, or they wouldn't be sent to them. But a reporter who finds out about the information some other way is not bound by the embargo. I doubt Anthony tried to find out but agree with you that he was under no obligation to do so. Anthony to his credit at least recognises that embargoes have some meaning and his comment suggests he'd respect them if he was asked to do so. Steve Milloy on the other hand, if he got the press release directly, was breaking the embargo. Oops, just saw my heading. Fair enough - it does say Anthony broke the embargo. In the text it's explained further. No, Milloy did not break any embargo, because he had not agreed to one. Embargoes are a two-sided agreement, not one-sided. The belief that anyone can send anything to anyone and expect the receiver to hold onto it until some sender-declared time has passed is naive. Again, what point am I missing? It's your claim -- please explain it. Sou, is this bloke being deliberately dense or is he one of those mushy, hairless-balled apologists for the deniers? Steve Milloy's a mate of yours, David? Explains a lot. Ian, not sure. Maybe both. "A man is known by the company he keeps." This is exactly what bothers me, in part, about all this -- the notion that people have to line up, take a side, accept whatever in order to be part of some team. And if you don't people on that team -- usually anonymously, viz. cowardly -- will insult you for it. These studies, from Oreskes 04 to Cook now only exist because of the contrarian misinformation campaign. Perhaps we should be more annoyed about the contrarian misinformation campaign? No, I'm not saying that at all -- only that someone who has not agreed to an embargo is not bound to respecting it. The sender takes their chances. A complete lack of ethics. Stolen emails anyone? I don't agree on Steve Milloy on anything I know of ... but he, or anyone, still has the right to publish on something someone sends him unsolicited. It breaks no ethical rules. So if you don't want someone writing about something you give them until a certain time, don't give it to them unless you've reached a prior understanding. Period. A journalist's job is to provide information, context and analysis, not to just pass along information as if they're someone's message boy. It's naive to think otherwise. Appell is going into overdrive trying to cover his arse. In this post he claims "Nor am I "sneering." This is the comment that he left at William Connolley's blog which started it this discussion. "Who cares? Science isn’t done by the number of papers that seem to support a certain position, nor by how many amateurs rank important. This is a meaningless exercise by John Cook (no surprise there)." Correct -- science isn't done by counting papers. "science isn't done by counting papers." Would you like to be a bit more specific David. Are you suggesting that the authors claim that AGW is proven because there is a consensus in the literature? If so, would you like to point to where they make that claim? "Consensus doesn’t prove human-caused global warming. Instead, the body of evidence supporting human-caused global warming has led to a scientific consensus." "A journalist's job is to provide information, context and analysis, not to just pass along information as if they're someone's message boy. It's naive to think otherwise." By your own words you are damned. You've provided no context, no analysis, a churlish slant and a very silly straw man argument about the paper. "science isn't done by counting papers" Well duh, thanks for the bleeding obvious Einstein. You know this argument is fallacious. "science isn't done by counting papers"
Depends on what you are researching! "Leading Voices in the Denier Choir, Conservative Columnists’ Dismissal of Global Warming and Denigration of Climate Science"
"The conservative “echo chamber” is a crucial element of the climate change denial machine. Although social scientists have begun to examine the role of conservative media in the denial campaign, this article reports the first examination of conservative newspaper columnists. Syndicated columnists are very influential because they reach a large audience. We analyze 203 opinion editorials (“op-eds”) written by 80 different columnists published from 2007 to 2010, a period that saw a number of crucial events and policy proposals regarding climate change. We focus on the key topics the columnists address and the skeptical arguments they employ. The overall results reveal a highly dismissive view of climate change and critical stance toward climate science among these influential conservative pundits. They play a crucial role in amplifying the denial machine’s messages to a broad segment of the American public." @MikeH - He might be trying to cover his arse. He's doing a poor job if he is. He just keeps baring more and more of it. After a tweet exchange with Revkin, I'm getting the picture that some blog/journos don't want consensus, they think they need dissent. If people agree, they think they won't have anything to write about. They might have to do some work of their own instead of "he said" "she said" followed by "I'm above all that, I'm just the honest broker reporting what people think - one thinks the moon is made of cheese the other not. Gotta give them both a fair and balanced hearing". @Ian A It's pretty amazing of David to make that comment, especially after his lazy blog post. His history on some events shows a distinct lack of skill in describing context or analysis let alone adding information (other than information about his own opinion). This thread has been revealing - about a lot of things. David, yes, science isn't done by counting papers. However, if you're in a situation where a large group of people claim that the science isn't settled and that there isn't a consensus, then I can't think of any other way to determine what level of consensus exists amongst the a scienctific community. I know that many "skeptic" dislike the word consensus, but I can't think a better word to use to describe a scenario in which a large fraction of scientists agree on the fundamentals in a particular science area. Is it any big secret that you'd better agree with the hand that feeds you? I've seen too many researchers jumping on the bandwagon because of grant money. As surely as rain follows the plow, the standard model is always correct.